Discussion in 'General Discussion' started by Bob, Oct 1, 2018. JMP, Bob and TonisToo like this. 1987 my first bike. Fully dressed Kawasaki, KZ 900.thought I was king of the world with full Vetter fairing and cassette player! Wish I has a photo but a last I must have lost those in my divorce too! Downsized to Yamaha virago 750. Crashed and totaled. Not my fault. Same story. No photo. 10 years with not bike. New wife convinced me to ride again. God bless her. Apparently I was cranky. Bought 650 Versys. Upsized to St 1300,fast red. Now blue streak St 1300. Not too many but I. Satisfied. Forgot my trusty XR 100! In Illinois where I grew up, you could attain a license for a “motor driven cycle” (under 150cc) at the age of 16. 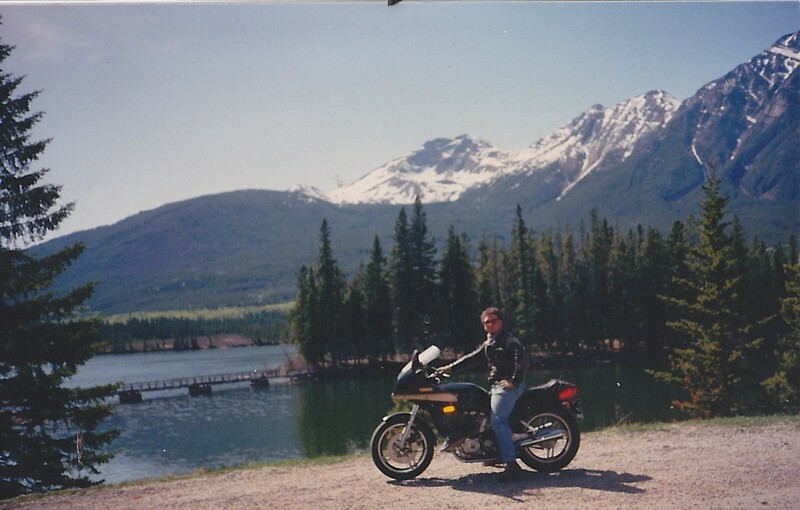 Thus began my lifelong love affair with motorcycles and touring. 1972 Kawasaki Enduro 125, purchased new for $475. Practised stealth riding on local roads and trails before licensed. 1974 Honda CB450 twin purchased used. Far and away the worst bike I ever owned. Shook like a paint mixer. 1978 Yamaha XS11, the HP king of its era. Added touring accessories and put 50,000+ miles on it in four years. 1983 Honda Sabre 750. Downsized when The Mrs. got her own bike. Third worst bike I’ve owned. Many design flaws. 1984 Yamaha Venture Touring bike. Totalled it at 20k miles when a joker turned left in front of me from second in line. 1986 Kawasaki Voyageur XII. Extremely reliable if not terribly exciting touring bike. Put 80k trouble free miles on it. 1992 HD Dyna Daytona Commemorative. Guess I had to have one in my life. Big mistake. Bought low, sold high. Soon. 1994 Honda ST1100. Well built, reliable, and just could not get comfortable on it. Put a quick 10k miles on and traded. 1995 Honda GL1500 Gold Wing. Put over 50,000 touring miles on. Suspension sucked. Too heavy. Stone reliable. 2000 BMW K1200LT. Here begins my conversion to BMW spokesman. The Mrs. says it was by far her favorite ride. Put 50,000 trouble free, exciting miles on it. Only negative was, a little top heavy when fully loaded. 2005 Honda ST1300. Decided I needed a Sport Tourer. Did not “speak” to us. Almost too efficient. No soul? Don’t know. 2007 BMW R1200RT. Best sport tourer we had. Excellent wind protection and cornering ability. Relatively light weight. 2009 BMW R1200GS. After traveling virtually every paved road, figured it was time to seek some dirt and gravel roads. Toured far and wide seeking the roads less traveled, from Alaska to Newfoundland and in between. Awesome! Those roads less traveled on the GS, by providing a comfier perch for our soon to be extensive travels. The Mrs.
Also decided to get her own Honda CRF250L to investigate this forest and fire roads up in the North Woods. Over (she is obviously the brains of the operation). Gone are the CRF250L and Terra 650. Touring like the TLH with TonisToo last year. Ironically, The Mrs. flies to The Rock to join the Tour there. Are the last straw (kidding) in my decision to return to the most versatile motorcycle I have ever owned. Easily. So I guess my current tally is 18 motorcycles, way more than the number of cars I have owned. I am sure that there are many here who would scoff at that number, and probably with good reason, but each bike I have owned has contributed memories unique to that bike, and so doing has played a part in the patchwork quilt of my 700,000+ miles to date. Bob and TonisToo like this. 1980 Honda CM400T, borrowed from dad. 1984 Suzuki GS550E, my first purchase. 1995 Kawasaki KLX650C, wheelie machine. 1998 Kawasaki ZX7RR, chiropractors dream. 1998 Suzuki Bandit 1200, more my style. A 8 year period raising a family. 2007 Kawasaki Versys. The start of my MADHD. 2009 Suzuki DR650. The start of my farkleitus. 2011 Yamaha Fazer-8. Beautiful bike. Traded for an ATV. 2009 Yamaha WR250X. Couldn’t live without a bike. 2014 Suzuki V-Strom 1000. Deal too good to pass up. 2016 Yamaha FJ-09. Better fit than the V-Strom. 2016 Honda CB500F. Sold the WR so my son could ride. JMP and Bob like this. 1980 Kawi 440 LTD. My only cruiser. 1975 Honda 550 four. Yoshimura pipe was obnoxious. 1971 Hodaka Ace 100. My first foray into weird. 1973 Yamaha RD350. 2 stroke street. Hold on to the bars. 1978 Honda GL1000. Stripped the vetter gear but still too heavy for day to day work. 1988 BMW K75s Learned what sport touring was about. 2003 Kawi ZR7s. Made more noise than HP but can't say I did not enjoy it. 1987 BMW K75s. Bought it as a parts bike and rode it for a few years without ever parting it. 2006 Kawi KLR 650. Pounded on that thing. 2002 BMW R1150 GSA. Some things just fit. 2005 Honda Big Ruckus. Day in, day out workhorse. 1991 BMW K75s. A fly and ride experience that opened up a whole world of possible purchases. 1979 BMW R65. Too small and too stiff. 2010 Can Am Spyder. Don't use it much but kept me upright when needed. 2002 Triumph Tiger 955i. Turns me into a friggen hooligan nearly every time I ride it. Always looking but manage to talk myself out of more purchases with common sense. I need for nothing else but want for one of everything. Two of the ones I really like. Very nice shot Mike! Recall the location? I don't think 18 bikes in 46 years of riding is to many at all Trash. Plus look at all the memories they've left you, and thanks for sharing those. I agree not every bike is the best one yet. Some can be bought because we need something while we're waiting for something we really want to become affordable or whatever. All solid choices for sure. Ran across some info on the KLX650 on line when I was researching some Kawi DS options recently. Seems it competed directly with the XR650R but parts were hard to get and Kawi didn't support it. Thanks Backdraft. Nice looking Seca. I put a lot of miles on my brother's 750 Maxim when I was between bikes... great ride when the carbs were balanced. I think I remember seeing pics of the DR BIG here before the forum crashed. 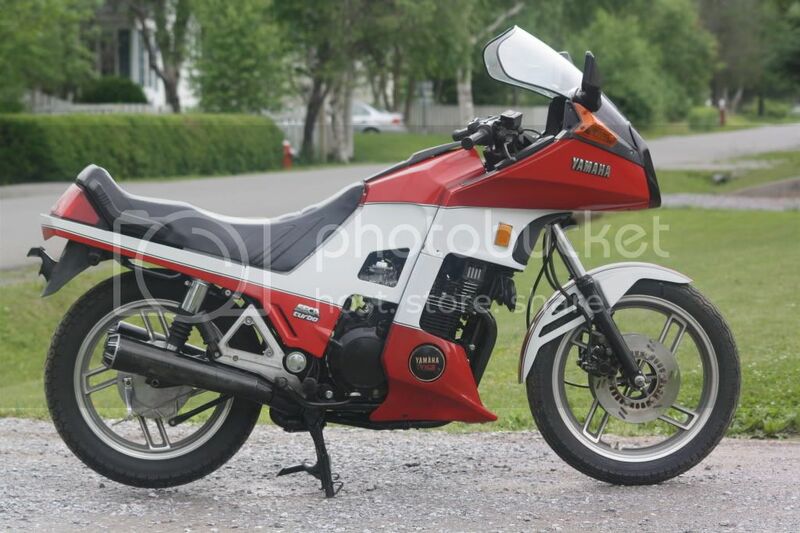 There's a couple of mid 80's XT350's for sale locally for $2500 to $2900 IIRC so they're still going strong. I seem to remember you posted up about one (or maybe both) of your BMW rebuilds. Seems the BMW R****GS/A is a popular choice among Inmates here. Never saw a Hodaka around, but back in the 1970's Handy Andy used to sell a JAWA where the kickstart doubled as a shift lever. Man that was weird. I remember when two strokes were street legal. Quick bikes, but smaller models didn't seem to last at highway speeds. Same for most smaller four strokes as well. But we were teenagers, working minimum wage jobs if we were lucky, so we bought what we could afford. I believe you dropped by my place with someone on a Kawi ZR7 one day, blue wasn't it? Yep, that 2002 R1150GSA looks like part of you all right, or is it the other way around? Just kidding! Either way, when you find that fit and feeling it makes all the difference. Wow, great variety of bikes, nice to see. I don't have a long list like some others, I started riding as a kid on a Honda Trail 90 (don't even remember the year) but sadly stopped riding after that and never picked it up until 10 years ago. Regret all those wasted year I actually like working on bikes just as much, or more, than riding so most of my bikes were purchased as cheap project bikes (hence the before/after pics). Honda Trail 90 CT90 - unsure of the year and sadly no pictures. Really want to find another one though, hard to come by. 1978 Kawasaki KZ650D1 - First street bike and loved it! Blast to ride. 1980 Honda CB400T - Bought just to fix up and sell. Engine had trashed head and transmission. 2009 Suzuki SFV650 Gladius - Beautiful engine and handling bike. Miss the torque. 1982 Honda MB5 - No bike puts a smile on my face like this one. I feel like I'm a Moto3 rider every time I'm on it. 1978 Honda XL250S - Bought a few years ago as a project, still unfinished. Engine had pretty severe damage to transmission and piston. 2014 Honda CB500X - Current daily rider. Love this bike, very versatile go anywhere, do anything type bike. Nice air shot JMP! Is that a ciggy in your mouth a la Steve McQueen ? Very nice combination of classic off road, dual sport, naked and sport touring machines. A lot of these pics look pretty current too. I'm thinking you still have the FJR and possibly the 2006 KLR and the '84 XR500 yourself? I like pics of restorations and builds and such so thanks for that too! Thanks for the nice pics Herr Deacon! Yet another Inmate with some serious restoration skills. From the pics it looks like you may have had several resto projects on the go at the same time? You too jumped in the deep end with a KZ650 as your entry level bike. They used to put our poor British twins to shame after about 80 MPH. IIRC six speed transmission? Yep, I've taken some long hard looks at the CB500X and their 750 as well. Finally starting to see a few low mileage gently used ones pop up FS too. Like you say, 'go anywhere, do anything' type bike.